Ask fellow campers about "Ambassador RV Resort" and nearby attractions. We have stayed here many times and it is always a great place to stay. The interior roads are wide and paved the sites are long and wide. The parking sites are large round rock and the there are cement patios at all the sites with a grass strip in between. The office and resort staff are all very nice and helpful. 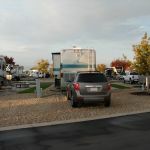 We camped at Ambassador RV Resort in a Fifth Wheel. This is our second stay in this park this year, this time on the way down South, stayed for a week. Consistently great customer service, cleanliness and order across the board and simply awesome atmosphere! Love their super wide sites where we could park 2 large vehicles on both sides of the rig. Will remain our go to park when we are in Nampa area! 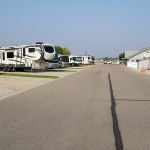 We camped at Ambassador RV Resort in a Fifth Wheel. We stayed 1 night while passing through the area. This park gets it! It only lacks paved/concrete parking pads. The park is a short drive from I-84 (Exit 29) along busy multi lane city streets. The intersection is controlled making turns onto the street easier. The interior roads are paved. The interior roads have sufficient width and gentle turns making maneuvering larger RV's easy. There is a mixture of back-ins and pull through sites. This park seems to understand the simple concept of the importance of a flat, level site as the sites were generally level and flat. The parking pads are rock. The P/T sites were long enough to say connected to a toad. Sites had sufficient room for opening slides. They have full hook ups - water, electricity (50/30/20 AMP), & sewer. The utility connections were spread out along the middle to rear of the sites. The sewer connection was at ground level making it easy to establish a downhill flow depending on discharge point. Sites have an outside table on a concrete patio but no fire pits. Site orientation allows RV's to cast shade onto the patio side. Distance, grassy & gravel areas establish privacy between the sites. Some of the sites appear to be extended stay sites. There were a few young trees scattered throughout the park and around the perimeter so satellite reception would be dependent upon your site and dish configuration. The park information listed about 37 cable channels but didn't mention anything about broadcast channels. Didn't try to get any broadcast channels. The park provided WiFi was good. It was password protected. Didn't try our Verizon WiFi hotspot or NET10 phone so don't know about reception. There is one designated fenced pet area with a grass surface located at the front of the park and another unfenced designated pet area along the street. It appears 2 sites were transformed into the dog park - impressive. We camped at Ambassador RV Resort in a Motorhome. There is a Flying J station just down the street for easy access fuel. Staff was very friendly and helpful. They insured that all my needs were met; including filling my propane tank (they picked it up, filled, it and returned it to me). They provided cable television. The park itself was exceptionally clean. 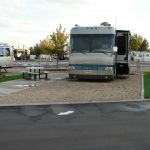 I especially liked the concrete pad I parked right next to; a closed pet area for off leash dog runs; a grassy area for each RV spot. The park roads are set up for easy access to park the RV (pull through with plenty of space to park in for both the RV and vehicle. 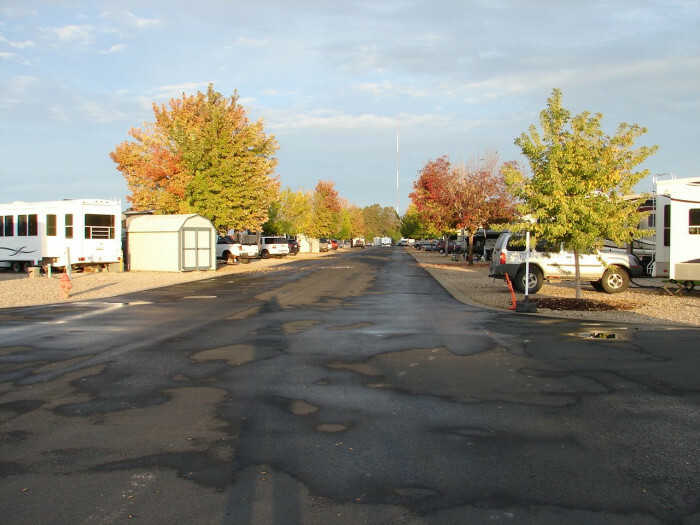 The park roads are set up for easy access to park the RV (pull through with plenty of space to park in for both the RV and vehicle. I have referred friends and family members to this park for future reference. I highly recommend this park because of the facility and personnel. We will plan on using this park in the future. We camped at Ambassador RV Resort in a Fifth Wheel. Easy access to many shops (Walmart, Albertson's, Camping World and many others). 1/4 mile off freeway made access to everything especially easy. This is an amazing park, almost perfect in every way. We were given a pull-through that was long enough for our trailer and our truck. The space for the trailer was gravel/rock, and there was a large cement pad on the side for the picnic table, with a nice strip of lawn between that and then next trailer. That cement patio would really be appreciated in inclement weather, although it was sunny (and a bit windy) when we were there so we didn't have to deal with any rain. The bathrooms are individual complete baths, and were spotlessly clean. We stopped here for two nights so we could visit friends in the area, so we didn't use any of the other amenities, but we would definitely stop here again when passing through. We camped at Ambassador RV Resort in a Fifth Wheel. Very lovely, large pull through sites, great service, lots of amenities, very clean. Pets welcome with a fenced in off leash area. Water is preset to 60 psi We camped at Ambassador RV Resort in a Fifth Wheel. 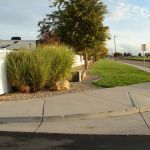 Next to Nampa with lots of shopping and rec facilities. Close to hospital. 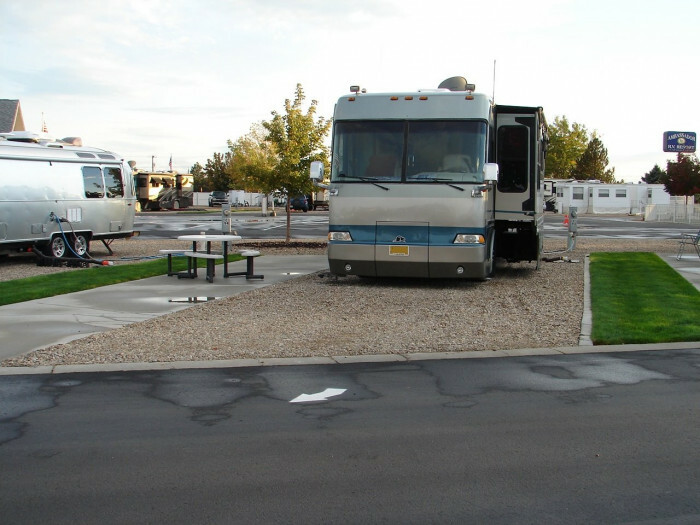 Ambassador RV Resort is a "Big City" facility for "Big Rig" travelers who want a safe, full-service "camping" experience when they visit the Boise metro area or transit along the I-84 corridor. We found the grounds and facilities (pool, clubhouse, dog walk, etc) well-maintained and the staff genuinely friendly and professional. Interior roads are concrete and very wide. Parking pads are crushed rock. Most sites have a concrete patio. A narrow strip of lawn separates most sites. There are no shade trees. The park seems to have a mix of long-term and over-night occupants, with more permanent residents set around the edge of the park. The park is easily accessible from I-84, overnight fees are reasonable, and there's a wide-variety of nearby shopping and restaurant options. When traveling through the Boise area, we would stay again. We camped at Ambassador RV Resort in a Travel Trailer. Nice park but the booking system is awful! They book the monthly spaces to customers first. I guess they get more money that way? We got there and they put us in a south facing site and it was in the 90's. We couldn't sit outside until after 7 PM. They did tell us we could put up a screen room but had to take it down every night. (seriously) The woman told me that they were completely booked and couldn't move us. Also, the site we were in was for people staying for a max of two nights. I said we were scheduled for a four night stay. They got around that by telling me that since I made a two night stay and called back 10 minutes later to add two more nights, that would be TWO reservations! We watched the row beside us during our visit. It was all north facing sites and they weren't filled every night. Also, 75% of those who did stay there were only there for one night. No one knows what site they get until arrival. They could have easily swapped us with overnighters coming late and leaving early. We won't be staying there again. I tried two times to get them to try to satisfy the customer. The women were very courteous and I don't know if it is a company rule not to change sites or they just didn't want to bother? Either way... it's not good. 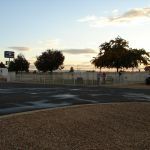 We camped at Ambassador RV Resort in a Motorhome. About 1/3 of the sites are back ins along the 4 perimeter edges of the park. The interior sites are pull through. All sites are mostly large (dangerous to walk on) gravel with cement patios and a sliver of grass between sites. The sites have cable TV and Wi-Fi. 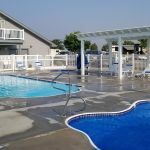 There is a pool area, a playground, and 2 bath and laundry facilities. We camped at Ambassador RV Resort in a Motorhome. This is a beautiful RV Park. It is very well maintained, the staff is friendly, the parking spaces are very spacious, the bathrooms are clean, it has an awesome recreation room, the Wi-Fi is excellent and it is very affordable. It will be nicer when the trees are more mature and there is more shade for the 100+ degree days while we visited (of course when the temps are that high, even bigger trees don't provide much aid.) It is easily accessible to the Interstate also. We didn't use the pool or the laundry room, but both looked very nice. We camped at Ambassador RV Resort in a Fifth Wheel. Paved interior roads, gravel, level sites with well kept lawn between & concrete patio, FHU's, and sites long enough to keep the toad connected. Pool, spa, sauna, small gym, clubhouse, & nice dog runs. Staff is helpful & friendly. 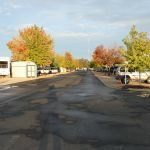 We camped at Ambassador RV Resort in a Motorhome. This is a well maintained park close to I84. The gravel sites are very long with a concrete patio, picnic table, and strip of grass. We got 3 bars 4G on ATT. The park also has WiFi (a little slow) and cable. There's also a nice, grassy off-leash dog area, pool, hot tub, library, and rec room. The wide roads make it very easy to get in and out. We would definitely stay here again. 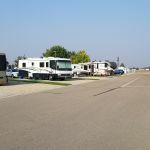 We camped at Ambassador RV Resort in a Fifth Wheel. This was the first time my husband and I had ever stayed at an RV campground and it exceeded our expectations. The campground and all of it's amenities were spectacular. It was extremely clean and quiet and we felt very safe there. We would definitely stay there again and plan on doing so again next year when we go back to the Caldwell Night Rodeo. We camped at Ambassador RV Resort in a Travel Trailer. This is the second G7 park we've stayed at and we liked both. Very well maintained, friendly staff and large sites. We would recommend this place but since they are full most of the time it seems that others already have done that. Easy drive into Boise. We would stay here again. We camped at Ambassador RV Resort in a Motorhome. Enjoy the revitalization of Caldwell, Idaho at the Indian Creek venue of downtown. Lots of restoring of the old town. Flying M coffee shop is there by the Indian Creek venue. Sit and enjoy this area. Boise, the capitol, is clean and beautiful. Part of the park's dog walk area was right next to a fast flowing canal with no fence and un-guarded intake at the northern end. No way our dogs would be allowed to get anywhere near that. Instead, we found Centennial Dog Park just a few miles away that has three HUGE enclosed areas. They loved it! There are interesting areas to visit within a comfortable driving distance, such as shopping, a petting zoo, museums of various themes, an outdoor shooting range. Their booklet lists surrounding areas of interest with directions. Most places that deliver will do so if you explain you are in an RV park and always remember to provide the site number. Many wineries with tastings are close by. Area is known for quality wine. Albertsons is a few minutes away. The Sage Cafe truck stop just up the road has great food at awesome prices. The front desk has all this information and will give you printouts of local attractions, shopping and restaurants. Take a drive to downtown Boise to visit the Basque Museum & Cultural Center. Great history and several great tasting Basque cafe's. Denny's with Flying J real close by. It is about a 30 min drive into Boise. Visited Silver City ghost town, a great day trip if you have a Jeep or other high clearance vehicle. We had lunch at the Idaho Hotel, one of the few businesses still in operation. Lunch was pricey but surprisingly fresh and tasty and homemade pies cooling on the counter. A great place for lunch is "The Orchard House" in Sunnyslope, about 13 miles away in the farmland. On the way, don't miss the fruit and veggie stand with farm ripened tomatoes! Close to service stations that sell diesel and are large enough for RVs. Short drive to grocery shopping and restaurants. Don't miss the pool. It's great! Caldwell was great for shopping, everything one might need was there. Caldwell is about 20 miles from Boise and 8 from Nampa. 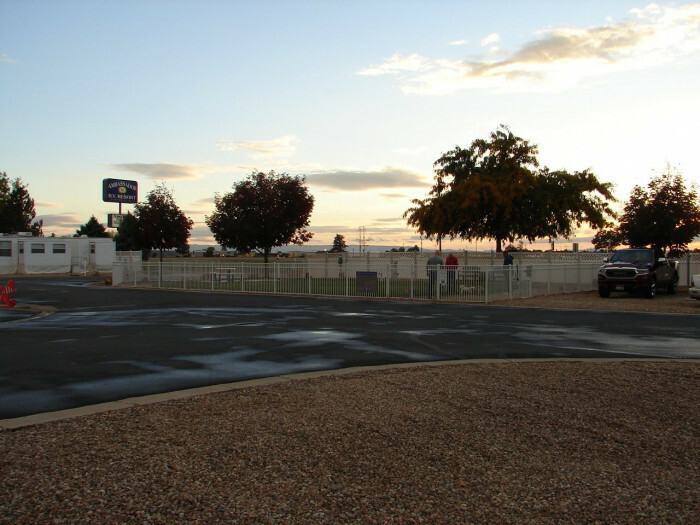 The park is close to shopping and has great access to Interstate 84. We road bikes in the mountains above Boise and found them very organized and not to technical. Several of the roads in the area, including I-84< are under construction right now making access a little tricky. We drove into downtown Boise and had breakfast at Goldy's. Worth the drive! Restaurants, gas, and shopping is nearby. Visit Ste. Chapelle winery. Very nice tasting room with beautiful deck to sit and have a glass. Order the brie cheese and apple plate with brown suger and pecans - yum. The Birds of Prey Center is worth a stop for Condors, and a variety of hawks/eagles. Wasn't thrilled with Boise. Too much traffic and people. Don't think we would come back here, but if passing thru would definitely stay here. No real nearby grocery store but Fred Meyers down the road in Meridian. Close to freeway ramps. Places to eat were close to campground. Be sure to do the farmer's market in downtown Boise. We visited Silver City ghost town. It looks like it did when people walked away 100 years ago. The hotel was open, and we had some delicious desert. Suggest you go on a week day as they said weekends are packed with no place to park. We attended the Caldwell Night Rodeo, our first rodeo ever, and we had a great time. That was a big highlight of our trip. One disadvantage was that the places to eat are several miles to the east. Make reservations!!!!! But they ask you to pay when scheduling your stay. 20% fee for "no show"! Really nice farmers market on Saturday in Boise. Caldwell is a nice area to stay for ease of I-84 and getting to Eagle, ID (15 miles) or Boise, ID (25 miles). Caldwell has excellent winery tasting opportunities only 10 miles from the park with over 50 wineries in the area. Boise offers a great botanical garden, Boise State Univ., the Boise greenbelt (25 mile bike path), the Raptor Center and the State House Capitol. Eagle is a beautiful suburb with great shops and restaurants. Less than 10 minutes to downtown Caldwell. A Flying j truck stop is just down the road. Instead of going to Boise down the Interstate, when looking for a restaurant or sightseeing, go out the resort and turn left at the traffic light. The road has lots of restaurants and places to stop and explore. Plus the drive is very pretty in a semi rural kind of way. St Chapelle Winery. Beautiful ride to get there along Chicken Dinner Rd. The winery is clean, pretty and has nice views. Loved the wine tasting. For a sweeter wine try the ice wine. See if you can find Chicken Dinner Road while exploring the countryside. Lots of places to visit if you like to take daily drives. Town just a few miles away for places to eat and shop. Convenient to Flying J and Interstate 84. Other shopping nearby. There are lots of wineries in the area. Also scenic drives to take. Very near Flying J, most major department stores, Cracker Barrel, Panera Bread, shopping centers, etc. Staff is very helpful in providing assistance whenever needed. Be sure to visit the Warhawk Museum you will not be disappointed. Looks small from the outside but go in and be amazed. There's lots to see and do in the area. Good Costco for Fuel and supplies about 10 minutes away in Nampa. Are you affiliated with Ambassador RV Resort ?